Lynn and I have been visiting Casey Key on the Gulf coast of Florida for many years and last weekend Mary joined us for another very pleasant stay over Labor Day. Casey Key is a barrier island created by the intracoastal waterway and is south of Sarasota and just north of Venice. It lies partially in the city of Nokomis, Florida and is an easy drive that’s about 2 hours from Orlando via I-4 and I-75. It’s a very wealthy community with very little commercial development and consists mostly of high end homes. There are a few small beach hotels near the southern end. We stayed at the Gulf Sands Beach Resort, which is an older place located right on the beach. Casey Key is very scenic and would be a good place to hold a workshop on sunset photography. The three nights we were there, they ranged from very nice to spectacular. Here is one photo I made with some fairly prominent sun dogs visible. Photo hints: We don’t normally go to the Gulf coast for surfing since the water is usually calm and clear. In the past I’ve seen it as clear as a swimming pool, so it’s often a wonderful place for snorkeling. Anticipating this, I brought my Canon G9 and underwater housing. But I didn’t get to use them much this time because the waves were pretty high (for the Gulf) and the water was murky. I think it’s still stirred up from recent tropical storms passing through. Casey Key itself has the best view to the west so get ready for some very nice sunset photos. The scenery to the east consists mostly of housing. You may get some color in the morning clouds to the west if you watch for it. You might also want to try a sunrise photo from the jetty area. For sunsets, set up early and stay late since the color often changes after the sun goes down. This is easy to do if you have a place right on the beach. You may also want to go back out later for some night shots. The night sky to the west will be fairly dark and allow you to get some stars in your exposure. Vary your foreground, the height of your camera, and your lens field of view to create some different looks. You’ll also see a variety of birds. We saw pelicans, gulls, Great Blue Herons, and several other species during our visit. Tripod/Monopod: You can get by without a tripod, but having one will give you much more flexibility. I tried some High Dynamic Range photography and was glad I had my tripod. Lenses: You’ll appreciate a wide angle lens for sunset and landscape photos. My most used lens was the 16-35mm wide angle. You might also want to bring a longer lens too for the birds on the beach and nearby. Best time to visit: Anytime (when the tropical outlook is calm). If you like to fish, you can do so from the beach and also from the north jetty which is a very short drive to the south end of the key. I once caught a very nice snook from this jetty, but had to let it go because the season ended the day before. Three Fishermen: A Great Blue Heron stalks two humans, waiting for a handout. There are many shells on the beach at Casey Key, so walking can be a bit rough for a city tenderfoot. You might want to bring something to walk in. And you definitely should walk the beach. 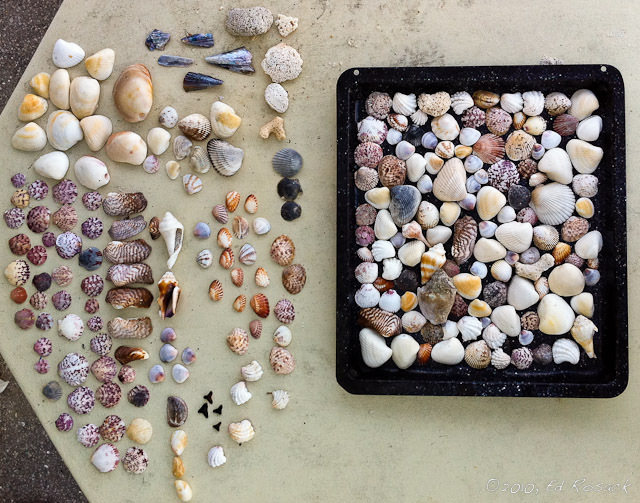 You’ll find many pretty shells as well as sharks teeth there. Warm Mineral Springs in North Port, Florida is a private resort with beautiful clear water. Take your snorkel and underwater camera. The Venice Rookery is a few miles south. This is a small island in a small pond and hosts many species during nesting season. If you’re there in the spring, be sure to stop by. The Myakka River State Park has an unusual Canopy Walkway that would be worth seeing. Oscar Scherer State Park is also very close by. We’ve also been to the Mote Marine Lab for an interesting visit. One morning we also saw one of their researchers monitoring the sea turtle nests on the beach at Casey Key. Please visit my set on Flickr to see more photos from Casey Key as well as larger versions of the ones above.